Laser Engraving is NOT the same as jewelry engraving! The text color depends on the specific chestpiece. It ranges from a goldish brown to a dark charcoal gray. Please note that the color of the laser engraving on the tubing is determined by the tubing color. It is laser engraved on the tubing and does not rub off. The engraving results in a goldish brown colored text on the tubing. The look is very professional and helps prevent theft. On the olive green, chocolate and burgundy tubing, the engraving is a black/brown shade and is not very visible. The color is controlled by the material the stethoscope or other product being engraved is made from. The engraving process does not delay your order! Our engravings are performed in house, allowing us to ship orders placed by 3 PM EST. Monday - Friday the same day! 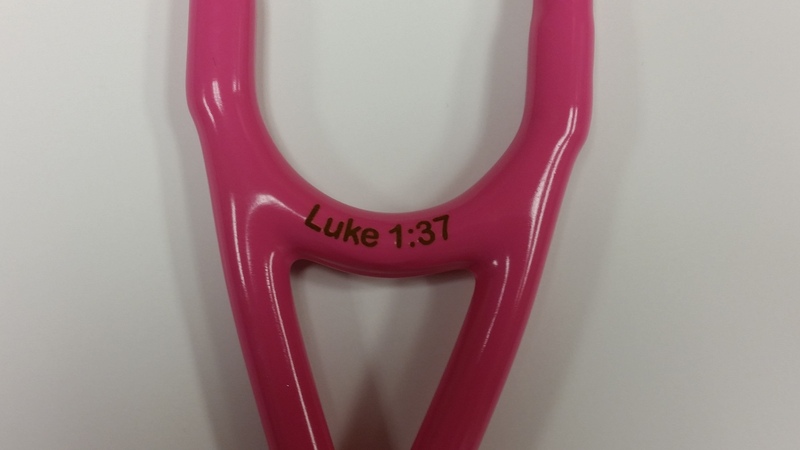 Engraved stethoscopes are not returnable! Standris Medical Supply, Inc. is NOT liable for any dissatisfaction in regards to alignment of engraving, appearance or font-type, etc. and will not accept any returns due to such dissatisfaction. We will only accept a return on an engraved stethoscope if there is a misspelling or typo when the engraving on the stethoscope does not match what was entered on the engraving field of your order!